The common cuckoo is a member of the cuckoo species and is scientifically referred to as Cuculus Canorus (cuckoo melodious) in Latin. It’s estimated that there are over 25 million common cuckoos worldwide, with over 12 million of them being in Europe. In this guide, we’ve provided a breakdown of some of the most interesting and intriguing cuckoo bird facts, including what this beautiful bird looks like, sounds like and where exactly you can find a cuckoo in the UK. What does a cuckoo look like? The common cuckoo can vary in appearance depending on its age. Young cuckoos are brown and black in colour (pictured above) with a cream, striped breast. Once a juvenile cuckoo becomes an adult cuckoo, the bird becomes much more grey and white in colour (also pictured above), however, its chest is still distinctly striped. 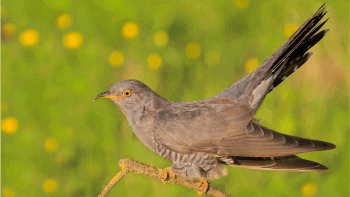 An adult cuckoo can somewhat resemble a collared dove. What does a cuckoo bird sound like? 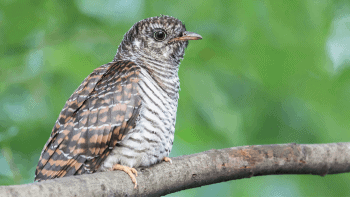 The cuckoo bird’s song is one of the most distinct bird songs worldwide. Known for its ‘cuckoo’ sounding bird call, the cuckoo does, in fact, whistle the well-known two-syllable song. Although most people are familiar with the cuckoo’s bird song, few have heard one in person. Have a listen to the clip below. The cuckoo is remarkably known for its egg mimicry, in which it lays its eggs in the nests of other birds. Over time, the cuckoo has evolved to imitate the eggs of many different species of birds. The female cuckoo will fly into the nest and knock one egg out to make room for its own egg. They can do this up to 50 times in just one breeding season. Once hatched, a cuckoo chick will push any other eggs out of its nest to make the most of its food supplies from its adopted parents. The cuckoo will often fledge around 17 days after hatching – during this time, its adopted parents will take care of it. Cuckoo numbers in the UK have dropped by 65% since the 1980s. As of today, conservationists are still unsure as to why, but it is thought to be down to a reducing number of ‘host’ nests. Hosts nests are declining due to a lack of food, climate shifts and agricultural intensification. However, conservationists and the British Trust for Ornithology are working together to resolve the decline of the cuckoo once and for all. What does a cuckoo eat? Cuckoos are well known for eating insects – particularly hairy caterpillars which are often unpopular with other birds. They may sometimes eat the eggs of other birds. The common cuckoo is known for its habitat in Europe and parts of Asia. The bird spends spring and summer in parts of Europe and Asia, but is known to migrate to Africa during the colder months. In the UK, you are more likely to spot a cuckoo in southern or central parts of the country, arriving in late March or April and often departing by September. If you’re looking to attract a cuckoo or any other wild birds to your area, don’t forget to grab some of our their favourite sunflower seeds for birds.